One of Disney's greatest classics, Dumbo is the timeless inspirational tale of courage, loyalty and triumph. Now, to celebrate the 60th Anniversary of this beloved high-flying adventure, Dumbo makes his first flight onto DVD, digitally restored and remastered to the original glory that captures the hearts of audiences all over the world. With a "Big Top" full of bonus features, there's something for audiences of all ages to enjoy. Featuring an all-new rendition of "Baby Mine" performed by Michael Crawford, Disney's "Celebrating Dumbo" featurette, two Sing-Along Songs and two animated shorts -- plus an exclusive sneak peek at Disney's Dumbo II and more -- this Special 60th Anniversary Edition of the timeless Disney favorite soars to greater heights than ever before! Awards: Won for Best Musical Score; Best Song-"Baby Mine". DVD: Standard 1.33:1; audio English Dolby Digital 5.1, Spanish & French Dolby Digital 5.1; subtitles English; closed-captioned; single sided - dual layered; 17 chapters; rated G; 64 min. ; $29.99; street date 10/23/01. Supplements: Audio Commentary from Film Historian John Canemaker; Michael Crawford “Baby Mine” Music Video; Exclusive Look at Dumbo II; Dumbo Art Gallery; Original Walt Disney TV Introduction; “Celebrating Dumbo” Featurette; Sound Design Featurette; Dumbo DVD Storybook; “Elmer Elephant” and “The Flying Mouse” Animated Shorts; “Look Out For Mr. Stork” and “Casey Junior” Sing-Along Songs; Publicity Materials, Weblinks. With this “60th Anniversary Edition” of 1941’s Dumbo, almost all of the movies from Disney’s early golden period appear on DVD. 1937’s Snow White and the Seven Dwarfs came out just a couple of weeks ago, while 1940’s Pinocchio and Fantasia have been available for quite some time. That leaves only 1942’s Bambi from that original phase, but don’t hold your breath as you wait for it; Disney have reserved Bambi as part of their “Platinum Collection”, and based on their current plans, it may not hit DVD for years. In the meantime, I guess we’ll have to enjoy the four that we can watch, and Dumbo holds up quite well alongside its era-mates. The film features easily the simplest story of the bunch. At the start of the movie, an officious-looking but late stork (voiced by Sterling Holloway) delivers a baby elephant to circus performer Mrs. Jumbo. All of the other female elephants - no males, including Mr. Jumbo, are seen - fawn over him until Jumbo Jr. sneezes, at which time his enormous ears unfold. The ladies gasp and instantly start to make snide remarks about the little fellow, cruelly renaming him “Dumbo”. Our wee protagonist receives love from his mother but only nastiness from everyone else. This reaches a peak when a bratty boy starts to mock and abuse Dumbo; Mrs. Jumbo loses it and goes on a mild rampage. This ultimately lands her in elephant solitary confinement, and Dumbo’s left to fend for himself among the inhospitable crowd. Happily, he eventually gains a friend and supporter through Timothy Q. Mouse (voiced by Ed Brophy). He takes the lad under his proverbial wing and tries to help Dumbo become a successful circus elephant. However, the results aren’t pretty, mainly due to Dumbo’s intrusive appendages; a gag in which Dumbo is supposed to stand atop a stack of elephants collapses when he trips on his ears. He’s then relegated to work with the clowns, which is regarded as sub-human - or sub-elephant - by those old biddies. Dumbo stands out among the five “golden age” Disney flicks because of its simplicity. At about 64 minutes, it’s the shortest of the bunch; heck, it lasts barely half as long as the two-hour Fantasia, which appeared only a year earlier. The styles utilized also seem more basic and lack the intricacy and depth of the animation seen in the other films. In many ways, Dumbo fits in better with the animated shorts form Disney than with the other features. However, I don’t want to slight Dumbo for it’s really a very strong movie. The plot is terribly thin, but the execution appears excellent. Packed into this short flick we find a slew of well-realized characters and situations. All of the participants are animated well, but Dumbo himself is a true marvel. Drawn primarily by Vladimir “Bill” Tytla, Dumbo offers a tremendously compelling and embraceable character despite the fact he never says a word. Tytla imbues the role with tremendous warmth and humanity; cute but not cloying, Dumbo’s virtually the perfect Disney protagonist, as he lacks a strong personality but never comes across as a cipher ala Snow White or Cinderella. Tytla’s a legend among animators, as well he should be; it’s hard to imagine that the same person created the tender and sweet Dumbo and also Fantasia’s truly evil Chernabog. If I had to pick a flaw in Dumbo, it’d relate to the rapidity and abruptness of the plot. Even with such a brief running time, the story seems stretched to fill the space. Many adore the “Pink Elephants” production number, and I like it as a piece of interesting animation, but I thought it took away from the plot; the film diverts to a long musical number that has nothing to do with the story, and it felt like filler to a degree. It’s fun filler, but it doesn’t advance the tale at all. The film also ends quite abruptly. When I watched Dumbo back in 1999, I hadn’t seen it in years. When I saw the time counter on my laserdisc player indicated that only three or four minutes remained in the movie, I couldn’t believe it; there seemed to be so much more that needed to take place to properly finish the tale. However, the movie rushed through that material. Ultimately, the ending is reasonably satisfying, but it felt hurried. Granted, Dumbo wasn’t alone during this era; as I noted in many of my reviews of Universal’s Classic Monsters films, a lot of those provided sudden conclusions with literally no denouements. Some controversies have arisen in regard to the version of Dumbo found on this DVD. I’ve heard rumors that the 64-minute edition here represents an edited cut of the film. Allegedly the black crows received much more screen time in the original rendition as they acted as a form of Greek chorus and commented on events. According to this concept, they were cut because of racial considerations; the crows were viewed as negative stereotypes so most of their material was sacrificed to the gods of political correctness. These alleged edits were made decades ago, which is why virtually no one remembers the original material. In support of his case, the Savant mentions a number of fairly abrupt fade-outs that occur during the film. I can’t argue with these, as the movie indeed does include some awkward shifts. However, these don’t prove anything. Was Dumbo butchered from its original length? Maybe, but at this point, I consider Disney innocent until proven guilty. I’ve consulted plenty of sources that make no mention of the change, and if one considers the magnitude of the alleged alteration, this would be a bizarre oversight by all those people. Even documentation of a longer running time would show something, but everyone states the movie lasted 63 and a half minutes. As such, right now I lean to the side that feels Dumbo wasn’t edited. One claim that the film was cut that comes based on decades-old memories doesn’t do much for me since I can find no other verification of the changes. These alterations may well have occurred, but until I discover more compelling evidence, I’ll stick with the belief that the DVD presents the original, unedited film. One area in which I disagree with the Savant relates to his interpretation of the crows. Many defenses of these characters have been made, but I find them unconvincing. Folks states that the crows aren’t black stereotypes and that their speech represents “hipster jive”, but I don’t buy it. On the affirmative side, the crows are depicted in a positive manner. They’re pleasant and helpful, and they’re shown to be accepting and fairly intelligent. However, their speech patterns do fall into stereotypes, with comments like “I done seen” and other statements of the sort. However, I didn’t feel that this material harmed the essential goodness of Dumbo. The film remains a Disney classic, as it provides all of the studio’s strong points with few of its negatives. After 60 years, the movie remains charming and delightful. 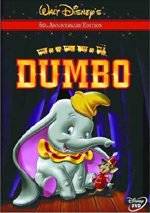 Dumbo appears in an aspect ratio of 1.33:1 on this single-sided, double-layered DVD; due to those dimensions, the image has not been enhanced for 16X9 televisions. For a 60 year old movie, Dumbo looked fairly good, but I expect more from Disney, especially after the glories of Snow White. As such, Dumbo offered a decent but flawed transfer. Sharpness consistently looked quite good. Throughout the film, it appeared accurate and well defined. I saw virtually no instances of softness or fuzziness, as the movie remained distinct at all times. Jagged edges and moiré effects also caused no concerns, and I discerned no signs of edge enhancement. Print flaws were a different matter, however, and they led to the majority of problems with Dumbo. On the positive side, the usual sorts of defects that mar older films generally were absent. I saw a few speckles, but not many, and more substantial issues like scratches, blotches, tears, debris, hairs and grit seemed non-existent. However, the print appeared excessively grainy and dusty. This gave the image a rather dirty and grimy look much of the time, and it negatively affected many aspects of the presentation. Because of this issue, colors came across less well than they could have. Overall, the tones seemed to be fairly rich and vivid. With its circus setting, Dumbo offered a nice variety of hues, and they were acceptably clear and distinct for the most part. However, the griminess made them appear more subdued than I’d expect. They still looked acceptable, but they lacked the strength I thought they should display. Black levels came across as nicely deep and dense, and shadow detail was appropriately opaque without excessive thickness, though the dirtiness of the print made those elements a little murky as well. Really, for a 60-year-old film, Dumbo looked quite good, as it lacked many of the problems I normally find in movies of its vintage. However, compared to other Disney offerings, it seemed problematic and it was a disappointment in that regard. Dumbo includes a new Dolby Digital 5.1 soundtrack; unlike Snow White, it doesn’t provide the original mono mix as well. Its absence was a disappointment, for while the 5.1 track was decent, I like to have the option to listen to the original audio as well. In any case, the new version was all I found, and it seemed like a reasonably effective affair. For the most part, the soundfield kept fairly centered, as music composed the majority of the stereo elements. The score spread across the front and toward the rear, and it did so in a moderately satisfactory manner. However, I thought the delineation of the music seemed somewhat weak. Differentiation of instrumentation came across as muddy; the score appeared to come from all around me, but it lacked much definition and sounded vague. Audio quality seemed generally good for the age of the material, though also not up to Snow White standards. Speech largely sounded acceptably distinct, but dialogue came across as somewhat brittle and sibilant on occasion. This edginess made the lines seem less than natural, but I discerned no concerns related to intelligibility. Effects showed minor harshness at times, but the usually appeared to be fairly clear and accurate, and they even provided some good depth on occasion; for example, the thunderstorms provided nice low-end response. In comparisons with the supplements found on Snow White, the DVD release of Dumbo again comes up short, but it offers a fairly solid little package nonetheless. First we discover a running, screen-specific audio commentary from animation historian John Canemaker. He also appeared on the tracks for Snow White and Fantasia, but in those instances he spoke alongside archival audio of Walt Disney as Canemaker helped frame the boss’ remarks and add some perspective. Less compelling is Celebrating Dumbo, a featurette that definitely lives up to its title. In this 14 minute and 50 second piece, we hear from a slew of Dumbo fans as they tell us how much they love the film. This roster includes critics and historians such as Leonard Maltin, Rudy Behlmer and John Canemaker plus Roy Disney and current Disney staff like Andreas Deja, Don Hahn, and Ron Clements. They relate why they think Dumbo is such a special movie, and we also see some clips from the flick. The tone seems a little too heavy on praise and light on details; a few tidbits about the production emerge, and it’s nice to hear a professional perspective from the Disney personnel, but these don’t constitute much of the program. Ultimately, the show is moderately entertaining, mostly because the participants demonstrate such enthusiasm for the movie, but the program lacks much informational value; it doesn’t substitute for a true documentary. Ala the new rendition of “Some Day My Prince Will Come” from Barbra Streisand on the Snow White disc, Dumbo includes a new version of Baby Mine from Broadway veteran Michael Crawford. He lip-synchs the song in a spare setting as we also see many snippets from the movie. Oy, I thought Babs was bad! Crawford’s sappy trilling makes her track look like pure buttah! There’s one extra I’ll never watch again. Much more entertaining is Sound Design, a five minute and 55 second clip that actually comes from a minor 1941 feature called The Reluctant Dragon. The premise of the film showed writer Robert Benchley as he toured the Disney studios; fans demonstrated a lot of interest in the making of cartoons, so Dragon was created to disseminate the experience. Anyway, Benchley slips in to this session in which the audio is recorded for a Casey Jr. cartoon. He meets “Doris”, a babe who does the train’s voice, and then watches as the foley work is done for the clip. Note that this is not the same Casey Jr. material found in Dumbo; it’s unique footage that I believe existed just for Dragon. In any case, this was a fun little piece that makes me wish they’d actually release the whole Dragon program on DVD. (It’s only been available in its entirety on VHS, and I think even that tape is now out of print.) By the way, who knew a babe voiced a cartoon choo-choo? That Doris was hot! In the Dumbo Art Gallery we find a nice collection of stills. Subsumed into seven different categories, each subheading includes between nine and 73 frames each for a total of 168 shots of material. Over the last year or so - since the October 2000 release of titles like The Black Cauldron - the still galleries on Disney DVDs have used thumbnail functions, and Dumbo follows that trend. I really like this idea, as it makes navigation of large art sections simpler. The images found on Dumbo are quite interesting to see, as they cover the usual array of concept art, character sketches and other pictures. One unusual piece shows an Original Walt Disney TV Introduction. In this 63-second snippet, Disney briefly discusses Dumbo as he leads into… I don’t know. It looks like a TV broadcast of the movie, but I can’t imagine that he showed the whole thing on the tube at that date. Maybe he did. In any case, this little snippet was modestly interesting. Next we discover an “exclusive” look at Dumbo II. In this 170-second piece, we see a few snippets from the upcoming direct-to-video release and hear from some of its creators. It’s purely promotional and puffy and not very interesting. More entertaining are the two Silly Symphony shorts found on Dumbo. We get the nine minute and 20 second “The Flying Mouse” from 1934 and the eight and a half minute “Elmer Elephant” from 1936. The latter’s the more compelling of the two, and it offers a clear precursor to Dumbo. “Mouse” connects in a more tangential way and it seems excessively cutesy, but it’s fun to see as well. I love it when Disney DVDs toss in these vintage shorts, and both “Elephant” and “Mouse” are enjoyable pieces. A few kid-oriented extras appear as well. We find two Sing-Along Songs: “Look Out for Mr. Stork” and “Casey Junior”, and we also get a “Dumbo DVD Storybook”. As usual, the latter allows kids to read it solo or follow a narrated piece, but the second option is more interactive than normal here. A few times during the text, some additional character icons appear, and you can here little soundbites through them. It’s a fun presentation. In the Publicity Materials domain we discover two trailers. The original theatrical clip for the 1941 release runs 130 seconds, while a reissue promo from 1949 lasts 78 seconds. The latter is essentially a shorter version of the former. Note that the DVD messes up the presentation; the original trailer appears in the reissue’s slot, and vice versa. When you start the DVD, you’ll find ads for some other Disney flicks. There’s a promo for the upcoming theatrical release of Return to Neverland, as well as trailers for video releases of Mickey’s Magical Christmas: Snowed in at the House of Mouse, Cinderella II: Dreams Come True, The Hunchback of Notre Dame II. In addition, these clips can be found in the “Sneak Peeks” area alongside additional ads for Whispers: An Elephant’s Tale, an upcoming DVD special edition of Peter Pan, The Book of Pooh: Stories From the Heart, the upcoming Walt Disney Treasures releases, the Disney “Gold Collection” as a whole, and “Toon Disney”. As far as DVD-ROM features go, Dumbo includes little. There are some weblinks but nothing else. The package also tosses in a little cardboard Casey Jr. that you can assemble. Overall, Dumbo isn’t the strongest Disney DVD on the market, but it’s a nice little package for a sweet little movie. After 60 years, Dumbo still offers one of the studio’s strongest offerings. It tells a cute tale and does so in an endearing manner. The DVD features decent but drab visuals plus acceptable sound and a reasonably good roster of extras. All in all, it’s a solid set that belongs in the collection of all animation fans.